Players from Liverpool, Tottenham Hotspur and Manchester United have been named in UEFA’s Europa League Squad of the Season, alongside seven from winners Sevilla. Emre Can and Philippe Coutinho make the 18-man squad after helping Liverpool to Wednesday’s final in Basel, where they were beaten 3-1 for Sevilla’s third successive triumph. Spurs star Toby Alderweireld is one of five defenders. The Belgian played every minute of Tottenham’s campaign before they were thrashed by Borussia Dortmund in the last 16. David de Gea’s inclusion is extremely strange. The Manchester United stopper played only two games in the competition and conceded three goals across two legs against Liverpool. 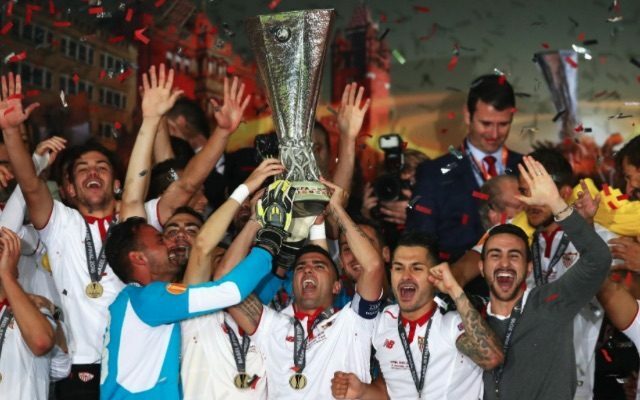 There must be a few aggrieved goalkeepers out there, but what is not a surprise is that nearly half of the squad is made up of the Sevilla side that lifted the trophy at St Jakob-Park. The #UEL Squad of the Season is here! Adil Rami, Mariano, Ever Banega, Grzegorz Krychowiak and Steven N’Zonzi are all recognised from the Spaniards, alongside goalkeeper David Soria and eight-goal striker Kevin Gameiro. The competition’s three leading scorers this season – Athletic Bilbao’s Aritz Aduriz (10), Villarreal’s Cedric Bakambu (9) and Dortmund’s Pierre-Emerick Aubameyang (8) all make the cut. We don’t know who De Gea is sleeping with, but the rest of the squad is pretty fair!